Mr Inbetween is an American 30 minute scripted crime television series, which kicked off on September 25, 2018, on FX and is broadcast every Tuesday at 23:25. The show is currently in its 1st season. FX has officially confirmed the renewal of Mr Inbetween for Season 2. The exact release date is yet to be announced so far. Sign up to track it down. Juggling a new relationship, parental responsibilities, friendship and a sick brother while earning a living would be difficult for anyone, but it's particularly difficult when you're a hitman. Ray Shoesmith "takes care of people" - collecting debts, relieving them of drugs and guns, and often taking care of them on a permanent basis. Ray demands respect and does not tolerate anyone who doesn't live up to his very strong and very clear code of ethics. The few he trusts - daughter Brittany, brother Bruce and best friend Gary - he'll do anything for, so when Gary is set up by his own brother-in-law, Ray rips the lid off a Pandora's box of inter-gang conflict and personal retributions. As a series of very unfortunate, very bloody and darkly funny events play out, the bodies pile up, and Ray must avoid being one of them. October 9, 2018 - Mr Inbetween has been renewed for a second season by FX Networks and FOXTEL, it was announced today by Eric Schrier and Nick Grad, Presidents of Original Programming for FX Networks and FX Productions, and Brian Walsh, Executive Director - Television, FOXTEL. The second season will premiere in 2019, broadcasting day-and-date on FX in the U.S. and FOXTEL, Australia's leading cable network. 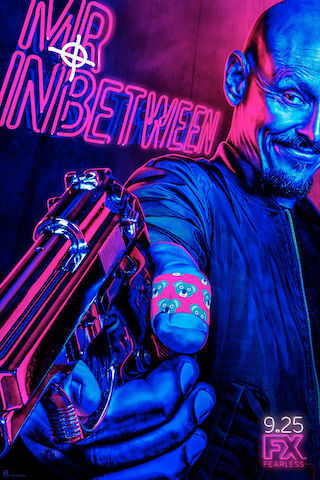 We can't wait to return to Ray's world in season two of Mr Inbetween."